News UK has unveiled a research project that highlights the correlation between what people read and their subsequent online behaviour, conversations and purchases. The study by News UK Commercial, called Project Footprint, shows how exposure to advertising on the tablet edition of the Times provokes offline conversation as well as searching online and purchasing products. The results also demonstrate how exposure to advertising has a strong correlation to brand advocacy. Developed in partnership with comScore and the Keller Fay Group, Project Footprint closely tracked the online and offline activities of 70 multiplatform subscribers to The Times over the course of a month. 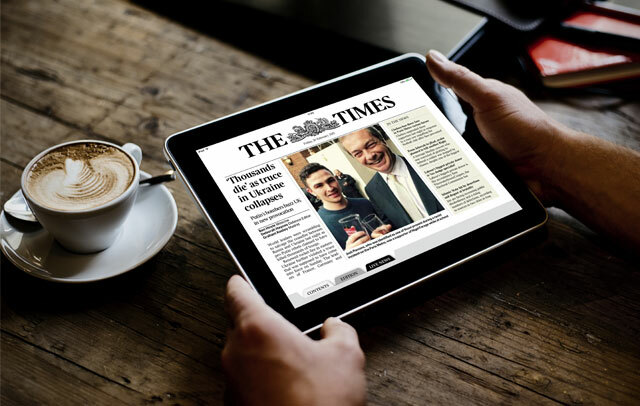 Key findings include how Times readers are a digitally hungry audience, spending 63 per cent more time online and visiting 57 per cent more pages than the average internet user. Times readers were also found to be notably inquisitive, spending 372 per cent more time with Google compared to the average internet user. The study also found readers spend 56 per cent less time with social network giant Facebook compared to the average internet user. Advertising exposure demonstrated a strong correlation to brand advocacy in various categories e.g. supermarkets (95 per cent of brand advocates also saw an ad for their preferred brand during the month), banking (86 per cent), airlines (75 per cent) and Cars (65 per cent). Advertising was also found to drive higher offline conversation levels for a variety of brands, compared to a non-exposed control group e.g. Burberry +150 per cent, Mr Turner (movie) +114 per cent, VW +67 percent, Barclays +36 per cent, Audi +28 per cent and John Lewis +16 per cent. Advertising exposure also drove higher online behaviour (brand search/website visitation), compared to a non-exposed control group e.g. cinemas +111 per cent, Marks & Spencer +50 per cent, Lloyds Bank +18 per cent. Advertising exposure also drove higher offline action (purchases/brand choice) versus non-exposed control group e.g. BMW +163 per cent uplift (versus non-exposed control), VW +80 per cent uplift, Audi +33 per cent uplift, HSBC +10 per cent uplift, John Lewis +7 per cent uplift. Project Footprint also revealed a significant proportion of Times subscribers having a conversation and taking online action for an exposed brand e.g. retail (40 per cent), movies (14 per cent), banking (13 per cent), auto (7 per cent). Abba Newbery, director of strategy for News UK Commercial, said: "Our proposition is that we deliver the most engaged audiences possible. This research proves that our audience is at their most engaged and attentive when they are consuming our content, more likely to use search and more likely to take an action." Mike Read, UK senior vice president and managing director of comScore, called the study "ground-breaking", claiming it provides a "more complete view of the effectiveness of digital advertising". He added: "By combining observed behaviour from a single-source panel across PC, tablet and smartphone with word of mouth insight, we have learnt a great deal about how exposure to advertising provokes conversation, reinforces advocacy and drives actions. "The more evidence we can provide to advertisers and media buyers about the return on investment from brand advertising in engaging environments, the faster we can move away from simplistic, flawed models like final click attribution."